There are a few occupational hazards that must be dealt with when working out in the mountains and the plains and when they are coupled with the utter solitude of the job caution becomes paramount. I spend all day driving on gravel roads that give way to two tracks, miles from the nearest person or dwelling, hours from town let alone a hospital with Socorro being the closest, at a given moment a three hour drive away. There are pot holes and rocks, the ever present chance of a flat tire or getting stuck in an arroyo, always a possibility of tripping and falling or some other foolish dysfunction but none more predictable than the rattlesnakes, they are a certainty. 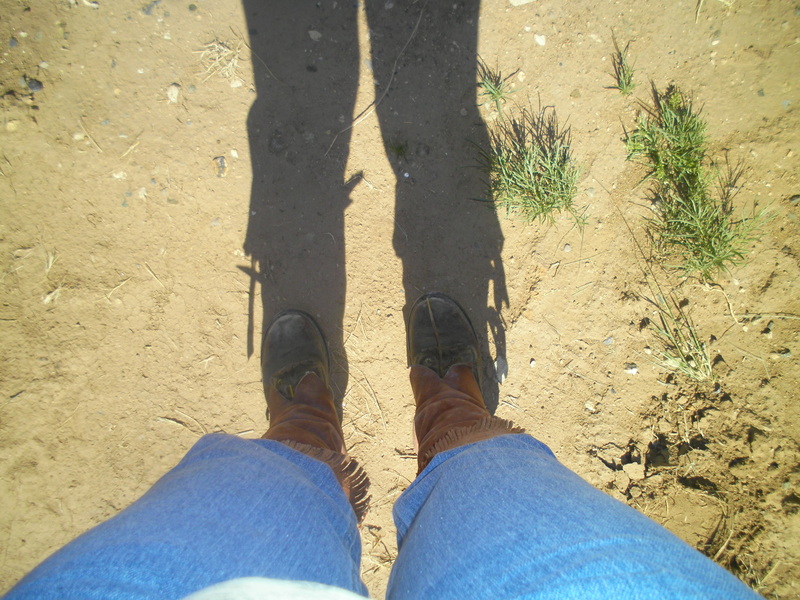 It is not if but when I will have a close encounter, this is their territory and they as all other creatures in this arid country are drawn to water, as I am measuring wells and springs, so am I.
I have made myself a pair of leather leggings. Originally they were a gift from a friend who was profess in making such things and we made a soft light pair from some pretty deer tanned leather. They wrapped around the calves of my legs and doubled below the knee with a pretty fringe around the top and laced on with doubled strings of leather, pretty. I donned them when I went to work to give them that weathered look that only real use will provide as I wanted them to look original and period correct. Once I wandered out to measure wells with my legs so clad I quickly concluded that they were not only stylish but very practical as well. I decided I should not only wear these houseauxs routinely but that they should be serviceable also; the original intent was to protect ones legs from both thorn and tooth, a heavier pair was in order. I now dress my legs with heavy leather coverings made out of oil tanned leather suitable for chap or bag and standing as a barrier from all that would threaten my tender flesh, snake boots if you will. I have long since come to ignore the sidelong glances that I occasionally get and receive an equal number of compliments from those who appreciate their purpose. Even when Antonio asked me what the chingaderos (a Spanish slang word for anything that doesn’t have a proper name) were for I had to smile and he could not help but agree they were a good idea, he can appreciate their function. In spite of the fact I have learned that rattlesnakes would far rather scare you away or flee whenever possible I am still well aware of their threat. I have had enough encounters with them to know that even if you come close to stepping on them they will almost always coil up and rattle a warning instead of striking and I have never had one attack me without provocation but they strike fast and far when they do. I have been bit by lesser snakes, the gopher snake is far more aggressive that the rattler he wishes to portray and will not only coil up and shake his tale while he hisses a close second to the deadly rattle he will also chase after you when angry. They strike fast and I have foolishly allowed them to draw blood from my hand while taunting them! The Mexican people will tell you that the rattlesnakes have crossed with the docile bull snake and birthed these hybrids; they are in fact a separate breed, the desert version of the bull snake if you will. Cicadas – The rapid vibration of their legs rubbing against each other on a hot summer day. In plentitude they could evoke an Alfred Hitchcock nightmare! Seed pods on thistles – Even the slightest breeze can bring that distinct familiar rattle of the seeds within their pods. Seed pods on anything that rattles – They are everywhere on a breezy day and when walking are prone to rattle at the slightest touch; the yuccas are my favorites and surely a snake dwells beneath each one. Wire rattling against a post – Again the wind is not always my friend! There is wire hanging off of many a post out here, saved back for the ever present need for a repair. Dry leaves on gourds – They form the perfect combination and hang all around the fence on my garden, another snake haven. Dry leaves on weeds – Or anything else that one might walk through! Gopher snakes – They would have you believe they were rattlesnakes before you had them for lunch. The metal spiral on a notebook against dry branches – My bad! 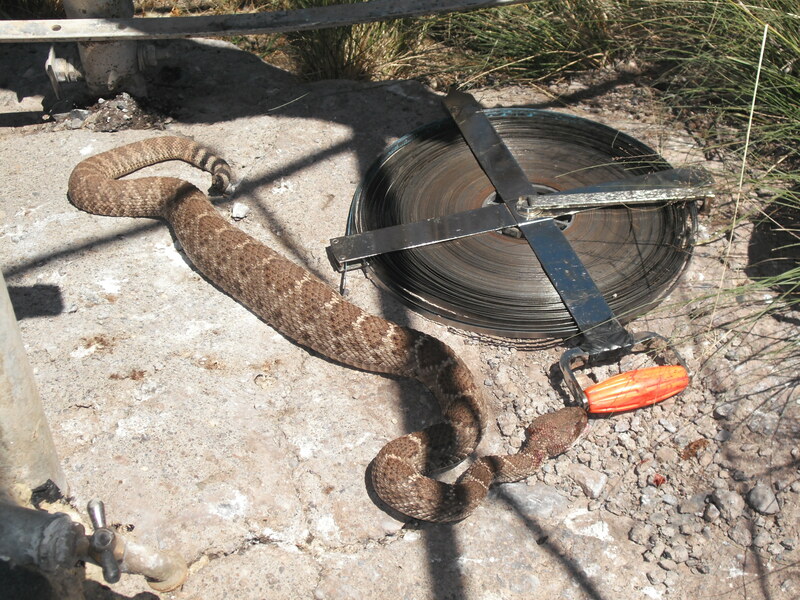 Rattles on snake tails – I take this one seriously and use great caution in killing the source whenever they are a threat to me or anyone else, even if they do kill rodents! Traps and poison work just as well if one wants to be rid of rats! Steel surveyors tape – The clash of the tape against itself is as clear as the abrupt rattle of a snake when you have come too close, sometimes their final warning, this one always gets me. Water splashing on rocks – Really! Perhaps I am getting a bit edgy but it really does! Better safe than sorry, snakes like water too and the grass is always thick. Absolutely love this. So well written, and such a clear picture of what you are up against in carrying out the duties of your job. And this is just one of the obstacles. My hat is off to you Cathie.